We're not allowed to know, and no one is allowed to tell us, and if we breached it, they by definition the person who told us we had breached it would himself be breaching it . . . It is totally mad. But it is English Law. Apparently, since we are not allowed to know that either. I still wonder how they can enforce a global ban? Surely our laws apply only to here or at most europe? I don't see how we can dictate to say America they they cannot print or name such and such? @Hobs wrote: I still wonder how they can enforce a global ban? Short answer is - they can't. That is why if you go on the internet you will see the 'facts' but on US, Canadian, or Australian sites, not UK registered ones. Many other countries have constitutions put together after generations of repressive totalitarian regimes had been overthrown, and have enshrined Freedom of Speech within them. Portugal is one pertinent example. English law is about 50 years behind technology, and has yet to work out what the internet is about. We can't dictate to America what they can say, which is why they can say it, and we can read it. What is still unclear is the legal situation if, say, I posted the link here to a US site where the alleged 'facts' about a famous homosexual couple's relationship were revealed. We are not supposed to know there is an injunction, and only think there may be because the US site has 'alleged' that there is. But they may be wrong. It could be "fake news", a mistake, or a deliberate lie to wind everybody up. So we don't know, and we are not allowed to know. I choose not to do it, partly because I would not wish to compromise the owner of the Forum, partly because I would not wish to give the people concerned the oxygen of publicity, and partly because anyone who wants can 'google' the names themselves. demanding you take the information down. except, obviously, that the Lawyers are able to charge a huge fee for having sent the letter. As a relative newcomer, I read all threads with interest but sometimes feel I'm missing what others with years of forum experience know. Is the thread title because of the exchange in Dianne Webster's rogatory? 4078: You also, when we spoke earlier, expressed a sense of frustration about the fact that you’d all been banned by the Super (inaudible). I think I saw a thread where it was reckoned something had been let slip, and 'inaudible' was a trick by the transcriber to cover it up? 4078: And you’d been very restrained in what you said. 4078: And yet you felt that you’ve been very badly let down because of what’s come out. It's clear from the context that DC 4078 means let down by leaks from Portugal, as DW takes this as her invitation to dribble on about the shortcomings of the Portuguese police. I believe press reluctance to criticise stems from the libel settlements against Express Newspapers back in 2008. Is there something somewhere else that points to an injunction? This is being done purely for money. There is no hope of their ever being able to influence anything. It is a bit like BWB denying that M3 had said they could have MBM back by Christmas, when KM had already put it in her book. They do it for money. @Jonal wrote: As a relative newcomer, I read all threads with interest but sometimes feel I'm missing what others with years of forum experience know. Is the thread title because of the exchange in Dianne Webster's rogatory? An interesting view, but if that were the case, why would the word "Super -" have been used. It would surely have read " a sense of frustration about the fact that their legal system won't let you speak out". And the use of the word "Banned" is also suspicious, if not to say indicative. when every article would be worth many thousands, points to constraint rather than restraint. That rather depends on the true nature of the crime committed - after all, these ordinary people are not secret service professionals required by law to sign an official declaration of silence. Effectively any one of them could blab if they have clean hands. The McCanns and their group of friends and seemingly specific allied persons threw themselves into this delusion from the word go. Would they do that if they weren't complicit? Who in their right mind would publicly confess to involvement in the disappearance, most likely death, of a three year old child - even for a million quid? Effectively any one of them could blab if they have clean hands. quite so. They could have told their versions of the entire holiday, produced all their lovely photos of their children playing with Madeleine, all neatly timed and dated, and cross referenced with the chronology in the book; of them all sailing together, of them doing art work and showing how theirs was so different from Madeleine's, of them having tennis lessons together, of them swimming, of them walking with Sammy Snake together with arrows showing their children and Madeleine, and then made a tear-jerking meal of how shocked they all were on the Thursday night, giving details of where they searched and how tired they all were afterwards, and how the police were helpful/unhelpful, useful/useless, fat/thin, sardine/squid munchers [delete as necessary] . . .
And not an invented article about any of them from the usual suspects. Their collective silence is most telling. but I think C-R are or were acting for him, as well, if that is possible. Schillings are named in this piece. What does it matter ? They are all shi***ng in the same pot and then thrusting their hands in to find the same 30 pieces of silver. This is a very telling bit, with parallels in another case we can think of. "The Topshop boss was accused of trying to “duck” a court battle with the Telegraph knowing that he would lose whilst focusing his financial power against individual employees. Sir Philip’s legal team were said to have abandoned the injunction as part of their “tactics” to keep him out of the witness box to avoid him being cross examined. Desmond Browne QC, representing the Telegraph, argued that the court must assume that the case is being dropped because he “feared that the public interest defence would have succeeded”. How can lawyers claim to hold the moral high ground when they act like this ? I realise they have some sort of "duty' to act for their clients, but surely decency and justice have a place . . . It can't ALL be about money, can it ? No, stupid of me. Sorry. Strike that out. @PeterMac wrote: How can lawyers claim to hold the moral high ground when they act like this ? When asked in court, if she was aware of the facts of the McCann case, a C R lawyer said, no i am just acting under orders. How could anyone just think of the client and their fee when a child is missing? They can't be human. They are of the human race. I guess it's much like being a physician and blocking out the dangers of where you're about to tread and paid big money irrespective of the outcome. Lawyers willingly defend the most guilty of guilty criminals, they care not one iota for common decency or moral rectitude. Their only concern is winning the case and making money. There is a lawyer around here - he drives a super top of the range jag and lives in an enormous house in 'quartier riche'. Chicken feed for him, but interesting quotes . Legal experts believe the way in which Sir Philip has pursued the case - and the vast sums of money involved - have demonstrated how the English courts can effectively be used to silence #MeToo victims in this country. Ministers are now expected to come under intense pressure to introduce new laws to stop NDAs being used to silence alleged victims of sexual and racial abuse. Maria Miller, the chairwoman of the Parliamentary Women and Equality Select Committee, said: “The UK Parliament has debated long and hard to put in place some of the best laws in the world to protect people from discrimination and bullying by unscrupulous employers. Yet, the evidence is that those laws are being flouted and unlawful behaviour covered up. We should not stand by and allow the victims of wrong doing, unlawful or criminal behaviour to be silenced, for serial offenders to be shielded by legal experts outside the scrutiny of shareholders and beyond the reach of corporate governance. "The most notable achievement of the courts during this process has been to slap an injunction on The Telegraph, which made it even harder for us to disclose allegations which were clearly in the public interest. And an injunction is perhaps another kind of non-disclosure agreement. "The Prime Minister has already indicated that she is uneasy with the way in which NDAs have been used. We ask her now to do something about it." Good cover, but more importantly GREEN, with Schillings being slapped down for grossly inflating their fees . . . So in this case Schillings have been caught out inflating their costs to their OWN client, Green. In another case - not connected in any way, and another firm altogether, - the suggestion was that the firm had been inflating their costs to threaten the respondent. It is not clear that their costs ever amounted to the amount quoted, nor that they were ever paid them. 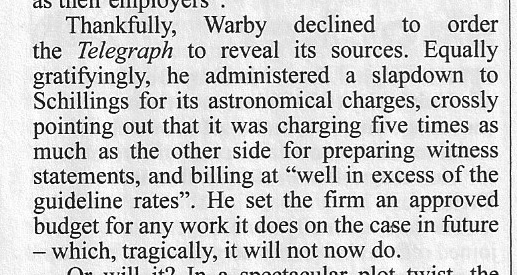 In this case the Telegraph had the financial backing to resist, and the case has fallen apart before the 'facts' have been aired in court. Yet again it exposes the reality of modern english Libel law. it has nothing to do with merit, or even of libel. The 'facts' are never tested. It is about who has the most money and can use it to bully the other. @PeterMac wrote: So in this case Schillings have been caught out inflating their costs to their OWN client, Green. Which is why the mccanns were so happy to sue anyone who disagreed with their version of events. They had the fund to rely on and if anyone on the board of directors opposed their actions then it was bye bye and add someone more amenable to their version of events and actions. This is why kate and gerry ended up on the board now staffed by family and friends. The mccanns weren't risking any of their own money or property, they were using the millions in the fund donated by the public to find Maddie. Quite how suing everyone including the ex lead detective was explained away as helping to find Maddie i don't know. The mccanns became accustomed to being effectively millionaires rather quickly which is not surprising since they were skint enough to need the fund to pay at least two payments on their mortgage although i don't recall being told exactly how much. These days the fund is used pretty much for personal expenses which is why the fund accounts we see each year are heavily redacted and little information can be gained from it, unlike the first one. So much for the transparency. Sir Phillip Green. Take his title away. Yet again shows what a farce the "Honours" list is. Pathetic.